White House counsel Don McGahn will be leaving the White House amid a flurry of ongoing investigations into the president's associates. Mr. Trump tweeted on Wednesday news of McGahn's departure, which is set to take place sometime this fall. "White House Counsel Don McGahn will be leaving his position in the fall, shortly after the confirmation (hopefully) of Judge Brett Kavanaugh to the United States Supreme Court. I have worked with Don for a long time and truly appreciate his service!" he tweeted. A source close to McGahn tells CBS News "he was surprised" by Mr. Trump's Twitter announcement and was not aware that the president had planned to send the tweet before it posted. While it was widely known within the White House that McGahn planned to leave after Kavanaugh's confirmation process concluded, McGahn had not discussed his plans directly with Mr. Trump, according to the source. Sen. Chuck Grassley, R-Iowa, chairman of the Senate Judiciary Committee, seemed dismayed by the announcement. He tweeted to @realDonaldTrump, "I hope it's not true McGahn is leaving WhiteHouse Counsel. U can't let that happen." Majority Leader Sen. Mitch McConnell said in a statement, "If the reporting is true about Don McGahn's time at the White House coming to an end later this year, it will be sad news for our country. "Don is the most impressive White House Counsel during my time in Washington, and I've known them all. His departure from the White House, whenever that may be, would be a big loss for the Trump Administration and the country." President Trump appointed McGahn to the position in November of 2016, calling McGahn a "brilliant legal mind" with "excellent character and a deep understanding of constitutional law." Before entering the White House, he served as general counsel to the Trump campaign and was a partner at Jones Day in Washington, D.C. specializing in political law. He's also a former FEC chairman and has served as general counsel for the National Republican Congressional Committee (NRCC). 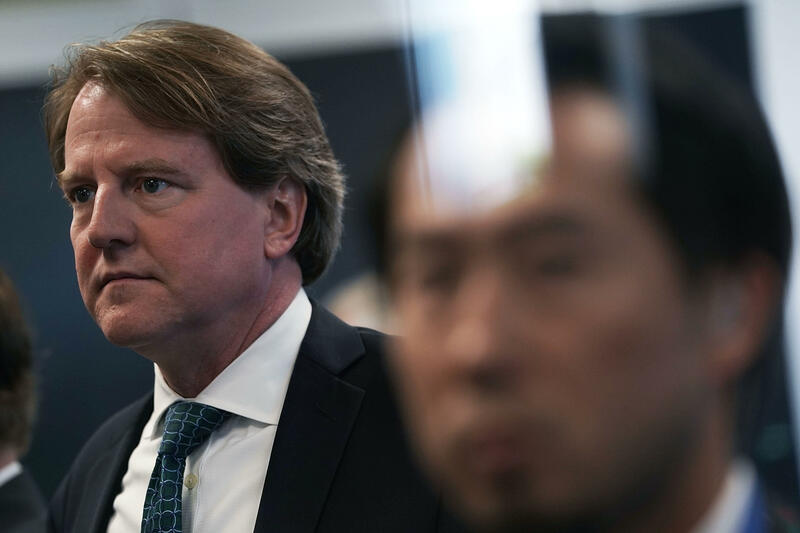 McGahn most recently made headlines after a New York Times report revealed that the lawyer has been cooperating extensively with special counsel Robert Mueller's probe in the 2016 presidential election, namely if Mr. Trump had obstructed justice during the campaign. The White House lawyer reportedly took part in three interviews with investigators, totaling some 30 hours of testimony. Mr. Trump, in response to the Times' reporting, lashed out at the outlet, claiming he "allowed" McGahn and other White House staffers to testify before Mueller's team of investigators, adding that he has "nothing to hide" in the matter. While Mr. Trump's personal attorney Rudy Giuliani has regularly gone to bat for the president on cable news outlets, Emmett Flood, an attorney for President Clinton in the impeachment proceedings in the 1990s, is rumored to be the likely pick to replace McGahn. McGahn previously threatened to resign from his position in June of last year, with sources telling CBS News chief White House correspondent Major Garrett at the time that the threat was communicated to senior staff, and was not a direct response to Mr. Trump's talk of firing Mueller. McGahn and other White House attorneys have previously have tried to back Mr. Trump off the idea of firing Mueller before he ends his probe, citing numerous risks and a lack of legal basis for his ouster. Katiana Krawchenko, Weijia Jiang and Alan He contributed to this report.